Q: We’re planning a church ceremony. Do you have any recommendations on how we keep that part of our day personal and unique to us, especially if our wedding ceremony will include a full mass? A: Getting married in a church is a wonderful way to honor tradition and include your faith in your wedding ceremony. While much of a church wedding ceremony is predetermined, adding personal touches throughout will ensure your ceremony feels authentic to you and your fiancé. 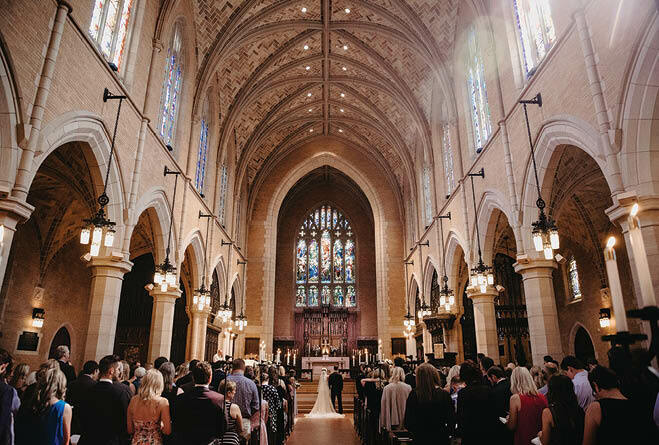 Lindsay Kunz and Kimberly Seymour, co-owners and lead planners of Pink Peony Weddings & Events, have helped dozens of couples plan their church wedding ceremonies; roughly a third of all weddings they helped coordinate last year featured church ceremonies. •Pick approved readings that resonate with you and your fiancé. Better yet, have family or friends read them during the ceremony. •Make your music personal. Select songs you both enjoy, and if you have any talented friends or family, invite them to perform as your musicians during the service. •If allowed, customize your wedding programs. Ensure they have the same look and feel as your wedding reception décor and highlight important people who are involved in your wedding (your bridal party, your families, and other friends or family involved in the ceremony). •Have a “Just Married” sendoff once you leave the church. Have your guests toss flower petals or sprinkles, blow bubbles or wave streamers. You’ll love your send-off photos and your guests will remember the scene for years. Q :Our wedding venue has a venue coordinator—do we also need an event planner? What’s the difference? A: There’s a big difference between an event planner and a venue coordinator. And depending on the level of assistance you’d like in planning and executing your big day, you might need a planner in addition to that venue coordinator. Most event planners offer a range of services, so you and your fiancé can decide if you’d like to be highly involved in planning your wedding from the start or prefer more guidance as you get closer to your big day. This ensures that your planning needs are met while adhering to your overall budget. Q: My fiancé and I are starting to look at our calendars, trying to decide how much time we should take off from work before our wedding. What’s standard for maintaining our pre-wedding sanity? A: It’s your wedding! In our opinion, the more time you can take off work, the better. This will help you feel calm and fully prepared for your big day. “Your wedding isn’t just one day,” says Josey Stafford, founder and head planner of Sixpence Events. “There’s the day before, where you have your rehearsal and rehearsal dinner. Then there’s the day after, where you might have a gift opening and brunch. But there’s also the week leading up to your wedding, which will be filled with extreme excitement, anticipation and likely last-minute to-dos,” she says. While it can be daunting looking at the total number of days off for your wedding, especially if you’re going on a honeymoon afterward, remember that this is a special celebration that you and your fiancé have been preparing and waiting for. You won’t want to look back on this time and remember feeling stressed and unprepared, wishing you’d taken more time off work. Feel confident with your decision and know that taking time off is normal—enjoy it! Q: What are the typical dress codes for weddings, and how do we indicate our dress code to our guests? Help! A: This is a question nearly every couple deals with. The best part? Wedding guests appreciate knowing the dress code. First things first: Determine what you want your dress code to be, but don’t worry if you don’t have anything specific in mind. “The weddings in our region don’t typically need to indicate a dress code for their guests, unless they specifically want to encourage their guests to be more formal or adhere to a unique dress code,” says Mariah McKechnie, owner and principal event specialist of Northland Special Events. Curious what your options are? •Semi-formal: Most people adhere to a semi-formal dress code (which doesn’t need to be specifically stated on your invitations). A semi-formal dress code typically means that men should wear a suit, while women should wear a nice dress, a fancy skirt and top or pantsuit. •Black tie optional: This is a step up from semi-formal. Men should wear a tuxedo or a formal suit and dark tie, while women should wear a long evening dress or a formal cocktail dress. •Black tie: This is the most formal wedding dress code. Men are encouraged to wear a tuxedo with a bow tie, while women should wear a formal evening gown. •If none of these dress codes fit the bill for your wedding, that’s OK. Especially if you’re hosting your wedding at a unique venue or somewhere out of state, your guests will likely be looking for guidance on what to wear. This is a great time to encourage a theme-oriented dress code. 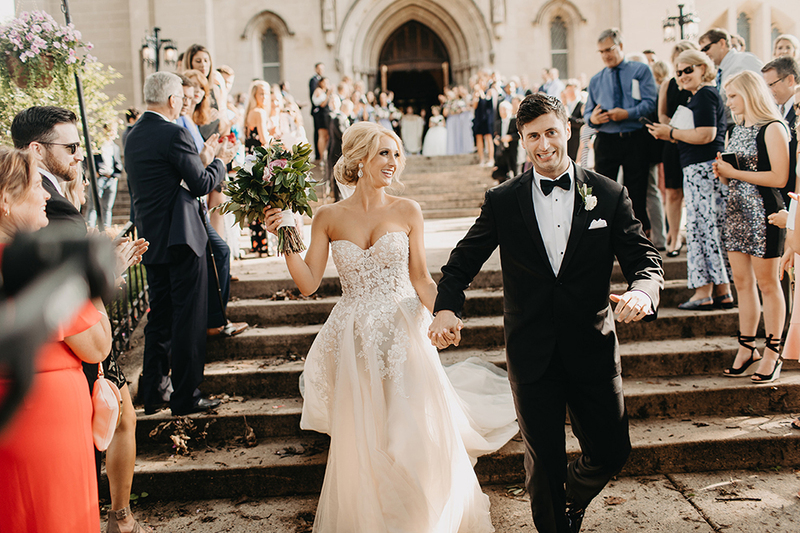 “I love it when couples have fun with dress code suggestions—‘Wear your best plaid’ for a northwoods wedding, or ‘Come dressed to dance in glitter and glam’ for a New Year’s Eve wedding,” McKechnie says. Your wedding invitations and wedding website are the perfect places to let your guests know the attire you’d like them to wear. The language needs to be included in the invitation suite, says McKechnie. It’s OK to repeat or elaborate on dress code information on your website, even though you’ve already mentioned it in the invitations.